Steinmann SP, Elhassan BT. 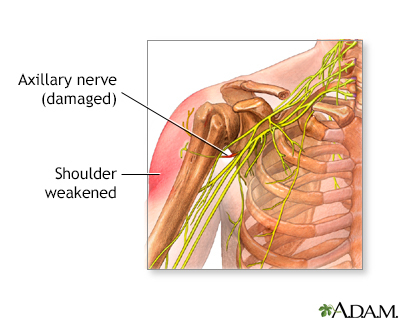 Nerve problems related to the shoulder. In: Rockwood CA, Matsen FA, Wirth MA, Lippitt SB, Fehringer EV, Sperling JW, eds. Rockwood and Matsen's The Shoulder. 5th ed. Philadelphia, PA: Elsevier; 2017:chap 18. Taylor KF. Nerve entrapment. In: Miller MD, Thompson SR, eds. DeLee and Drez's Orthopaedic Sports Medicine: Principles and Practice. 4th ed. Philadelphia, PA: Elsevier Saunders; 2015:chap 58. Conditions associated with axillary nerve dysfunction include fracture of the humerus (upper arm bone), pressure from casts or splints, and improper use of crutches. Other causes include systemic disorders that cause neuritis (inflammation of nerves). If the cause of the axillary nerve dysfunction can be identified and successfully treated, there is a possibility of full recovery. The extent of disability varies. The worst problem most often is shoulder weakness.